NBA great Shaquille O’Neal has been training MMA for ten years now. According to his trainer Jonathan Burke, Shaq is like fighting a grizzly bear. Shaq has been training BJJ, Boxing and Muay Thai and is not only picking up skills quickly, but is apparently ready to start calling out guys like Chuck Liddell as he did on Twitter. While I don’t see this fight ever happening, I do believe that Shaq could cause some problems for Liddell based on Shaq’s size alone. 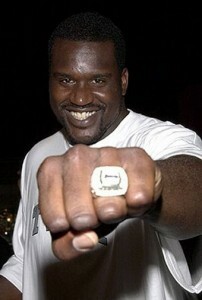 Would Shaq win, that is doubtful, but possible. It is amazing how many professional athletes from sports other than MMA seem to think they can step in the cage and do what these professional martial artists are doing. I am not sure if these guys really think they can be competitive or if they are looking for some publicity. There are some good athletes out there no doubt, but being a top level mixed martial artist isn’t just about being physically capable, you have to really know what you are doing and fighting has to be second nature. Just because you’re body is in world class shape, doesn’t mean a pudgy looking guy like Fedor isn’t going to tie you in a knot and beat your face in.